The Contribution Summary report summarizes the total and average contributions made to selected funds by givers in your organization. The filter options in the setup enable you to build a custom report of contributions by selecting specific funds, givers, a contribution date range, and contribution amount range. You may use this report to get a list of members who have given in the selected time range. In the Offering tab, Click Reports. From the Category menu, select Contributions. Then, select Summary to display the configuration for this report. Do the following: During the setup, the Contribution Summary section in the lower-left automatically updates as you make new selections. 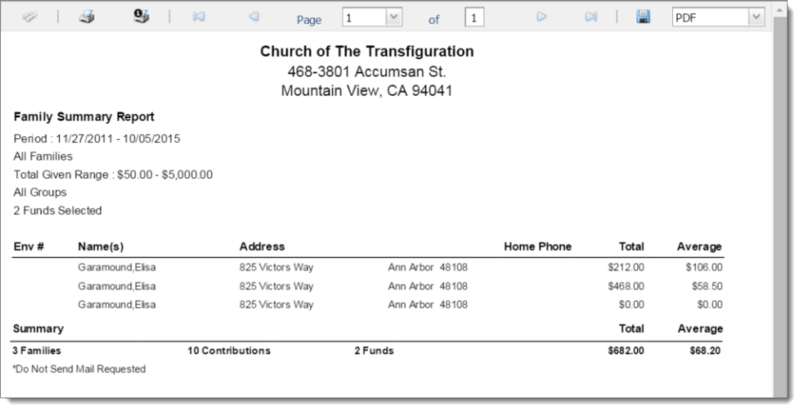 Starting on the Fund tab, select individual funds or select the checkbox in the grid header (to the left of the Description header) to select all funds in the list. Select the contribution date range. (optional) Total Given: specify a minimum value, a maximum value, or both. By default, the Include $0 Contributions check box is selected to include zero-dollar contributions in the report. If you do not want to include zero-dollar contributions, uncheck the box. In the Givers group, the Include Non-Givers in Report option is selected by default to include the names of non-givers—individuals whose total contribution to the selected funds is zero dollars ($0.00)—in the report. If you do not want to include non-givers, select (to uncheck) this box. If you include non-givers, the generated report includes the total and average dollar amount of contributions made to the selected fund by both givers and non-givers. The non-givers can be quickly identified as those whose total contribution is $0.00. Note that the inclusion of non-givers in the report does not affect the grand total summary average. Click Givers to advance to the Givers tab. The Givers tab shows the names of givers who match your filter criteria. If you need to change your criteria, click the Previous link in the lower right to go back to a previous tab. Alternatively, select the tab you want to go back to. On the Givers tab, individually select the givers you want to include in the report. Alternatively, select the checkbox in the grid header (to the left of the Family Name header) to select all givers in the list. If you are looking for a specific giver, use the header filters to try to locate the person. For example, if you know the giver's envelope number type it in the Env# header field. The software updates the grid to show the name of the giver matching your search criteria. To clear the filter, delete the information from the field. Review the information in the Contribution Summary section in the lower-left to verify that it is correct. To generate the report, click View Report. Use the toolbar controls at the top of the Report Viewer to page through the report, export and save it, or print it.